Those of all faiths, as well as people today who are alienated from organized religion, will find in this radical reflection on the most widely known (and misunderstood) of biblical texts a resource for both personal dignity and political resistance. When lived, as unpacked in this insightful book, the Commandments liberate us from oppressive systems, guide us to live lightly on the earth, and create the foundation on which we build beloved community. Progressives these days crave meaningful practices to help them live in light of their values – the kinds of religious resources and disciplines that the religious right has provided so usefully for conservatives. No Other Gods is a step in this direction. 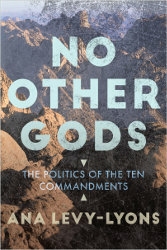 It reintroduces the Ten Commandments text as a politically and spiritually radical prescription. For example, the Commandment against stealing is extended to include any failure to pay fair trade price for consumer goods. The Commandment against killing includes deaths caused by environmental devastation. Those who want a meaningful way to live out their spirituality and politics don’t have to invent a bunch of new practices. There is a perfectly good set of ten of them, all ready to go, with as much progressive firepower as any of us can handle, that has existed for some 3000 years. Ana Levy-Lyons is the Senior Minister at the First Unitarian Universalist Society of Brooklyn. www.fuub.org. Featuring Tiffany windows, it is a beautiful gothic church built in 1844 in Brooklyn Heights, and has increasingly become a home for “nones” and the religiously “nothing in particular.” As her Ten commandments series became increasingly popular, we wanted to share her enlightening, compassionate and helpful view with a larger audience which we know is out there. Levy-Lyons is a rising star in a denomination of over 200,000 members, blogs and is a frequent contributor to Tikkun Magazine.